United We Stand, Divided We Fall -- And How! Peace, it's wonderful -- if only the troublemakers would give it a chance to take hold. A year ago in Charlottesville, Va., all was chaos and division as warring factions faced off against each other and began their own private civil war. Protesters marched as did counter-protesters. Casualties mounted; they included 32-year-old Heather Heyer, and the suspect in her death was a self-proclaimed American Nazi. It was hard to believe all this was happening in the land of the free and home of the brave, but sadly it was. Then there was all the collateral damage inflicted on just as innocent public servants. A helicopter being flown by the State Police to monitor events on the ground and guard a gubernatorial motorcade crashed, killing two state troopers. What a difference a year and a change of tone on the part of the nation's leadership can make. Commemorations of last year's violent hate-filled events took on a wholly different and much more welcome tone on Saturday. Police seemed to outnumber visitors and were diligently searching the bags of everyone allowed to enter at two and only two specified checkpoints. "It's nice that they're here to protect us," said a sales lady at one of the shops downtown. Last year it was a different story. It looked like a war zone last year compared to what it is today. Among the ceremonies over the peaceful weekend was a "morning of reflection and renewal" at the University of Virginia that included a speech by the university's president, James Ryan, who recalled how a group of students, joined by other citizens, confronted the demonstrators who were shouting slogans promoting white supremacy. He called it a "remarkable moment of courage and bravery." And it was only fitting that it should have occurred near a statue of Thomas Jefferson on campus. These folks weren't out to censor anybody, for they seemed to recognize that the best remedy for abuses of free speech was more uninhibited speech. Good for them. The police donned riot gear for a Rally for Justice on campus, which led to angry students chanting: "Why are you in riot gear? We don't see no riot here!" Maybe that's because the show of force by law enforcement had been enough to prevent any trouble while giving all an opportunity to shout out their opinions. Which is the way it ought to be at a great university in a great country. What we had at this shining moment, as professor and community organizer Lisa Woolfork put it, was "a huge, overwhelming show of force to compensate for last year's inaction." And it worked. One of the things an independent investigation into last year's riots by a former federal prosecutor found was that last year's chaos had stemmed from a passive response by law enforcement, an error that was not to be repeated this year. Typical of a lot of good folks' reaction to the return of the police to Charlottesville's streets was that of Kyle Rodland, who this year took his young boys to get ice cream downtown, and said he felt so much safer than last year, when the whole family left to stay with grandparents after Dad had seen people carrying long rifles walking around the family home. It is not force itself that threatens the peace of any community but unrestrained, free-roaming violence. 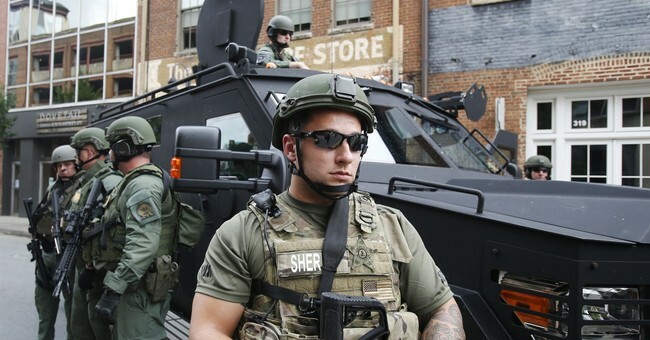 And this year a well-armed community rose up and took back its neighborhoods and streets. Give us a happy ending like this one every time. But be on guard: This story could be repeated when people decide to take the law into their own hands. That's not law and order but vigilante justice, which is not justice at all.